Disasters whether natural or man-made all have the potential to severely affect a person’s mental health. Recent research findings from disasters, such as earthquakes and floods, show that each person responds to and is impacted differently by these events. Earthquakes when compared to other natural disasters, cause the highest rate of severe damage and debilitating injury. This is because the effects of earthquakes last for an incredibly long time. Frequent and unpredictable disruptions can make it tremendously difficult for survivors to continue with their normal lives and recover their mental health. 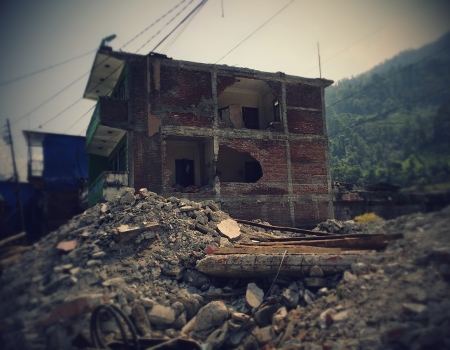 In 2015, Art to Healing directly responded to an 8.1 magnitude earthquake in Nepal. This devastating earthquake killed close to 9,000 people and displaced and severely injured 22,000. Together with The Lotus Centre International (USA), Art to Healing delivered disaster recovery art therapy programs to 30 local non-government and government organizations, and children debilitated by post-traumatic stress. 2. Recognize the vital importance of self-care. 5. Build resilience, strength and a healthy sense of self . 1. V.J Carr, T.J Lewin, R.A Webster and J.A Kenardy, “A synthesis of the findings from the Quake Impact Study: A two-year investigation of the psychosocial sequelae of the 1989 Newcastle earthquake,” Social Psychiatry, 32, (1997) 123-136. 2. S Galea, A. K Nandi, & D Vlahov, “The epidemiology of post-traumatic stress disorder after disasters,” Epidemiologic Reviews, 27, no.1 (2005), 78-91. 3. L. Najarian, A.K. Goenjian, D Pelcovitz, F Mandel and B Najarian “The effect of relocation after a natural disaster,” Journal of Traumatic Stress, 14 ( 2001), 511-526; A. K Goenjian, R. S Pynoos, A. M Steinberg & L. M Najarian, “Psychiatric comorbidity in children after the 1988 earthquake in Armenia,” Journal of the American Academy of Child & Adolescent Psychiatry, 34, no.9 (1995), 1174-1184. 4. A Roussos, A. K Goenjian A.M Steinberg, C Sotiropoulou, M Kakaki, C Kabakos, S Karagianni, & V Manouras, “Posttraumatic stress and depressive reactions among children and adolescents after the 1999 earthquake in Ano Liosia, Greece,” American Journal of Psychiatry, 162 no.3 (2005), 530-537.